The Sport Laundry Additive is gentle enough to use in multiple cycles. Your favorite running shorts will be sweat and odor free after washing with the Sport Laundry Additive. Normal detergents may mask the odor, but the second you put on your favorite jersey, the odor returns as strong as before. That’s because the odor was never neutralized and removed before; just masked by fragrances. Our Sport Laundry Additive is specifically formulated for athletic apparel. DRI-Fit, your favorite yoga pants (even if you don’t practice yoga in them), to that reflective vest that you didn’t think would get smelly, but did, because odor has no boundaries. 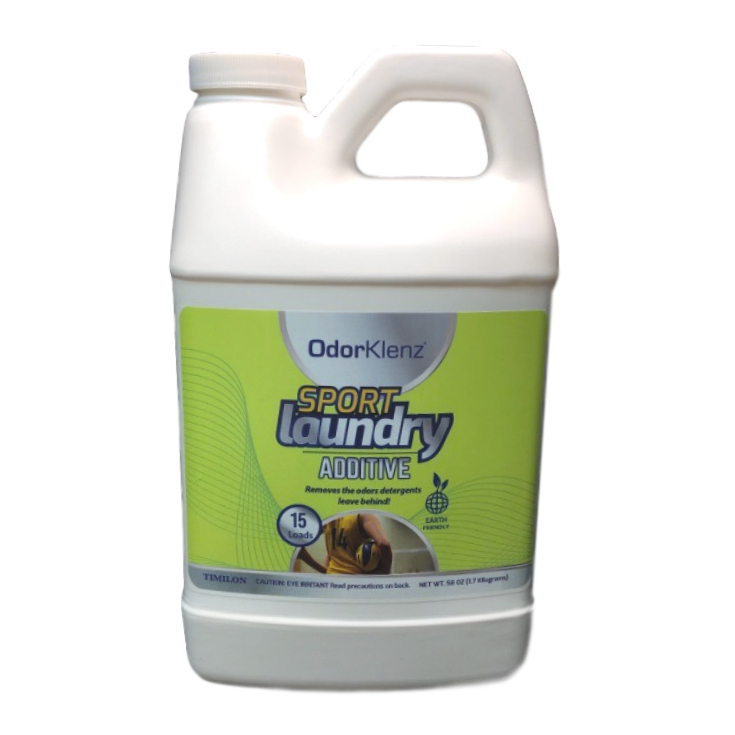 The Sport Laundry Additive is available in two options: liquid and powder. For the liquid formula, the laundry practices for best results include adding a ¼ cup for a small load of laundry, and a ½ cup for a medium load; add with your regular detergent. 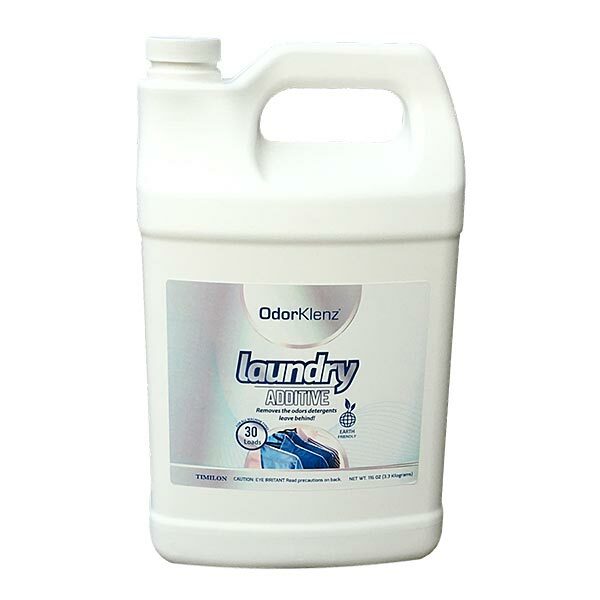 For optimal results in a top-loading washing machine, add the Sport Laundry Additive once the clothes in your wash basin are halfway submerged. For the powder option, add 1 scoop for small loads, and two scoops for large loads. Similarly, to the liquid formula, for top load washers, add the powder Sport Laundry Additive to your wash basin once the clothes have been submerged halfway. Make your victory all the sweeter with clean and fresh clothing, ready to tackle the next hurdle and stride into the next end zone feeling and smelling as fresh as your first victory. Victory sweat. It’s the sweat you have worked hard for, trained for, hit the gym at early morning hours to achieve that skill, get the gains, and earn that PR for. Victory sweat is the best kind of sweat. It’s also the smelliest sweat on earth. It seeps into your polyester blend athletic apparel and doesn’t let go. Because its victory sweat, and victory sweat doesn’t quit. But victors don’t have smelly athletic apparel. They have clean, fresh smelling jerseys. While athletic apparel is designed for flexibility and breathability, the synthetic fibers are a breeding ground for bacteria producing odor. All your victory sweat will produce more odor the longer it sits on clothing. That’s why we at OdorKlenz developed our innovative Sport Laundry Additive. With the strength to remove even the toughest lingering victory odor, but gentle enough since no harsh chemicals, fragrances, or bleaching agents are used. 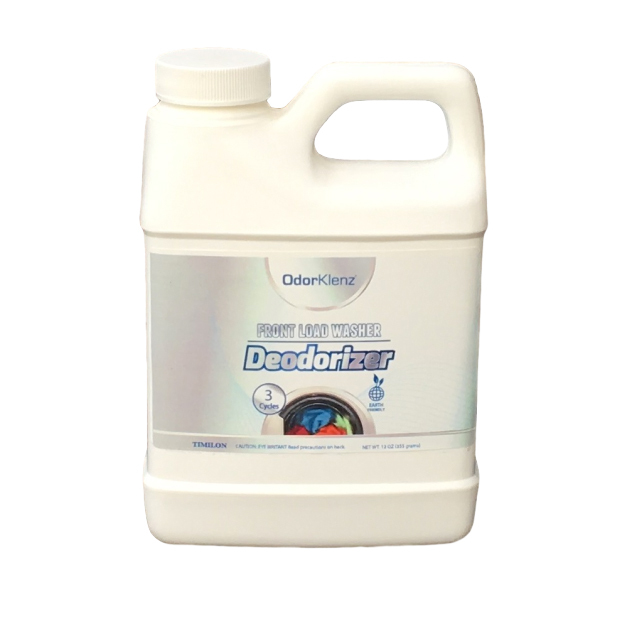 Optimized to neutralize and remove odor from even the most celebrated and well-worn sporting clothes. My gym clothes now smell fine. Actually, no smell at all which is perfect! I was going to throw them all out. I tried white vinegar and boiling them, and they still smelled! 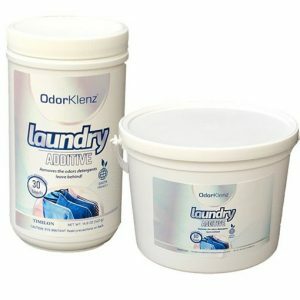 I now wash only my gym clothes together with the OdorKlenz Sport Laundry Additive and have not had a problem with odors since. I used this and thought that it made a slight difference to the sweat odors but didn’t completely remove them. I’ve tried 3 other all-natural laundry detergents and finally I’ve found one that’s scent free and gets the sweat funk out every time. Doesn’t have an overwhelming smell I feel like my clothes are actually clean when I wash them! This is a great laundry detergent for me since it doesn’t irritate my sensitive skin & everything smells so fresh! I bought this specifically for my gym clothes and it works well at removing sweat smell and not doing it with some cheesy perfumes. Love this stuff! I’ve been using the laundry additive and I love it! Effective product and solid customer service. This really works! My husband works in construction outdoors all day long and I’m afraid to wash his work clothes with anything else but OdorKlenz Sport. Great Additive! Gets the stink out of my super-sweaty workout clothes. Repeat buyer, great product! I have been using this and no sweat odors in my clothes for almost two years. Works great! Used one bottle over the course of a couple of months. It did seem to eliminate odors. Works great! If you have an old machine like me, just soak the clothes for the first load to remove the stubborn body odors! Great stuff- really works! I wish that I could buy it at Walmart and save on shipping. I had some DRI-Fit shirts that I LOVED, but they had started to build up some really funky smells, even after washing them. I eventually had to stop wearing them. I figured I’d use them as yard work shirts or something where it didn’t matter. Then I saw OdorKlenz and thought it was worth the money of not having to junk my clothes. I was impressed with how fast it got here and happier that my clothes have been salvaged. Great product – gets rid of sweat smell and doesn’t leave a lingering replacement smell! My husband purchased this product to use for sports clothing. It worked great and removed all of the odors from our clothes. This product worked wonderfully for me! It completely got the smells out of my clothes. I’ve been using this, and it really works for me! Great product! I purchased this product and it worked great! I am so glad I found this! Your product is beyond AWESOME! My boyfriend is a diehard bodybuilder and his gym clothes get pretty smelly. Sometimes I would wash them twice and it still didn’t help with the odor. But your product is a life saver. Also, I used this on my dog’s blankets which smelled even after it was washed but OdorKlenz removed the dog smell with one wash. I will be using this product from here on out! I absolutely love these products! The OdorKlenz Laundry additive does wonders on my husband’s work clothes and makes our towels fresh as new. I recently purchased your laundry additive for sports clothes and I am very pleased! It has saved me from discarding expensive sports clothing. Excellent product!